Ground Penetrating Radar Systems, LLC of Colorado was contracted to locate post-tension cables, conduits, and reinforcing steel at a new luxury mixed-use building in the downtown Denver area. 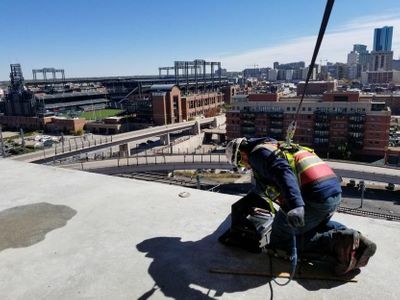 Utilizing ground penetrating radar, GPRS scanned multiple concrete balconies in the new 14-story high rise that overlooks Coors Field in anticipation of the client installing a rail system. The client had plans to introduce over 100 rail systems at this property, which all required drilling into the concrete slab. The ground penetrating radar antenna used to scan this concrete slab is made up of two parts; a transmitter and a receiver. GPR works by sending out a series of electromagnetic pulses, or signals, into a subsurface material, such as concrete. This pulse propagates through the material at a particular speed determined by the atomic structure of the material. When the signal encounters a different material, there is a change in speed, creating a reflection that travels back to the receiver on the GPR antenna. Once the reflective energy is received, it is digitized and imaged on the system controller screen in almost real time. The depth of the target, amplitude, or brightness of the reflection and the relative size of the target are detailed in the image. Ground Penetrating Radar Systems, LLC is able to locate post-tension cables, rebar, and conduits in the concrete slab by moving the antenna and control unit over the entire area needing to be scanned for the client. As the GPR is passed over the concrete slab, the image builds on the screen. Once the PT, rebar, or conduits are located, the GPRS project manager marks the location. Utilizing ground penetrating radar on your project has its advantage. In the construction industry, normal operations, including saw cutting and core drilling, have an inherent risk to the health and safety of the team conducting the work. There is also a significant risk for property damage. Protecting the structural integrity or strength of the concrete in any commercial or residential building and parking structure is very high on our client's priority list. GPR can detect both metallic and non-metallic objects embedded in the concrete slab and underneath it. Post-tension cables are of particular concern and danger. The high tension these cables are placed under is significant enough that if a PT cable is accidentally cut, it is possible that the cable could break through the concrete slab, injuring a worker as well as damaging the integrity of the structure. The goal of concrete scanning is to limit these risks and help to create a safe and efficient workplace. Ground Penetrating Radar Systems, LLC of Colorado completed over 3,000 jobs in 2018 throughout the Boulder, Denver, Colorado Springs, and Salt Lake City areas. The GPRS Mountain Region covers multiple cities throughout Colorado, Nevada, Arizona, New Mexico Texas, Wyoming, Utah, Montana, Idaho, Montana, Kansa, and Nebraska. To receive a quote or to schedule our services on your next project, please call our Operations Team at (303) 377-8270.